Firms progress through four stages of a developmental life cycle, each with their own funding needs. In the first stage, a new company’s external financing needs (EFN) are high, since it needs money to develop its idea but lacks retained earnings. They are usually financed through debt, but may find investors who are willing to take on risk if projected growth is high. In the growth stage, a firm’s initial EFN is high relative to its current value; it needs significant funds for growth. It can be financed through venture capital or issuing equity. 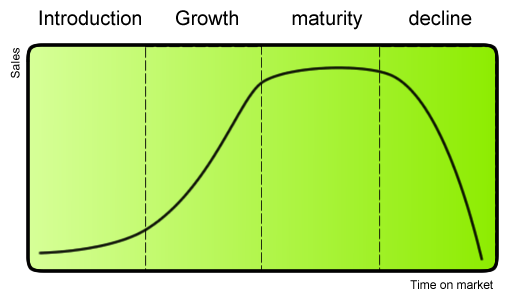 Growth eventually slows and the firm enters the mature stage. These firms can be financed by equity or debt. If they have no new projects, EFN is relatively low. The firm may go into decline as their product becomes obsolete or a competitor outperforms them. In this case, they have very low external financing needs. debt: Money that the borrowing entity owes or is required to pay to a lender. external financing needs: Additional funds needed from sources outside the firm, in order to support firm operations. Most businesses pass through a series of well defined stages based on their level of development. Churchill and Lewis (1983) identified that all businesses vary greatly in size and potentiality for growth. However, they all experience common problems that arise at similar stages of their development. From these observations came the four stage life cycle of the firm. Methods of obtaining financial capital may be more or less suitable for a firm, depending on the current stage of its life cycle. Firm Life Cycle: Firms progress through stages of development, indicated by their changing profits over time. In the first stage, a new company begins with the seed of an idea. Its external financing needs (EFN) are high, since it needs money to develop but lacks retained earnings. These young firms are frequently financed through debt, acquiring loans from banks and acquaintances. They may also acquire seed money, a form of securities offering in which an investor (usually friends, family, or angel investors) purchases part of a business. The source of the financing may depend on the perceived riskiness and growth of the business. After the firm is able to acquire external funding and develop its product/service, it enters the growth phase. Once a company has a successful strategy, it attempts to offer its products or services to potential customers–expanding first to other states and regions and then often internationally and globally. Successful companies can turn in increasing earnings year after year, evidenced by the increasingly steep slope in the diagram. Firms may face an increase in competitors. In the growth stage, a firm’s initial EFN is high relative to its current value; it needs significant funds for growth. If it fits the specifications for venture capital (high growth potential, innovative product) a VC firm may agree to finance the firm. It may also raise capital through equity financing. As it progresses through the growth stage, earnings begin to increase less rapidly. At some point, the company may decide to go public, offering its stock to the general public on a security exchange as a means of equity financing. Eventually, all possible customers have the product or service. They may still buy parts or replace their product with newer models, etc, but growth slows. This is the mature stage of a company’s development. If the firm has no new projects in the works, their EFN is quite low and internal funding is high. In fact, the firm may have so much in retained earnings that they cannot put all of it to productive use. They can choose to finance operations by issuing bonds and equity. When the firm has reached the final stage, sales can stagnate or decline due to replacement by a better product or competitor. EFN declines further. They may choose to retire debt or repurchase stock, as significant external financing is no longer necessary. Venture capital is an equity investment in a new company. Young companies with high growth potential turn to venture capitalists for funding because they cannot issue debt or raise capital in public markets. Venture capitalists assume high risk by investing in small, unproven companies, rationalizing that successful investments will have so much growth that their returns will far exceed any failed investments. By agreeing to fund a start-up company, the VC firm gets the potentials of high future returns, significant control over company decisions, and a portion of the company’s ownership. Because a VC firm’s returns are contingent on the company’s performance, it is in their interest to take an active role in company decision-making. A company receiving venture capital goes through several rounds of funding, roughly corresponding to stages of company development. IPO: An initial public offering (IPO) or stock market launch is a type of public offering where shares of stock in a company are sold to the general public for the first time. Through this process, a private company transforms into a public company. Venture capital (abbreviated as VC) is an attractive funding option for young companies with high growth potential, most often in high technology industries. These new companies are unable to raise funds in more conventional ways like bank loans. Investors assume high risk of loss in exchange for high potential of future growth, significant control over company decisions, and a portion of the company’s ownership. Obtaining venture capital is different from raising debt or a loan from a lender. Lenders have a legal right to interest on a loan and repayment of the capital, irrespective of the success or failure of a business. In contrast, the venture capitalist’s return is dependent on the growth and profitability of the business. Return is earned when the venture capitalist sells its shareholdings. This happens when the business goes public, issues shares to the general public through an Initial Public Offering ( IPO ), or is acquired by a third party company. Guaranteed seats on the company’s board. Liquidation preferences – in any liquidation event, the VC investors get their money back, often with interest before common stock is paid any funds from liquidation. Initially, VC firms establish a fund which pools money raised from individuals, companies and other interested parties. This pooled investment vehicle is then used for investment in start-up enterprises. 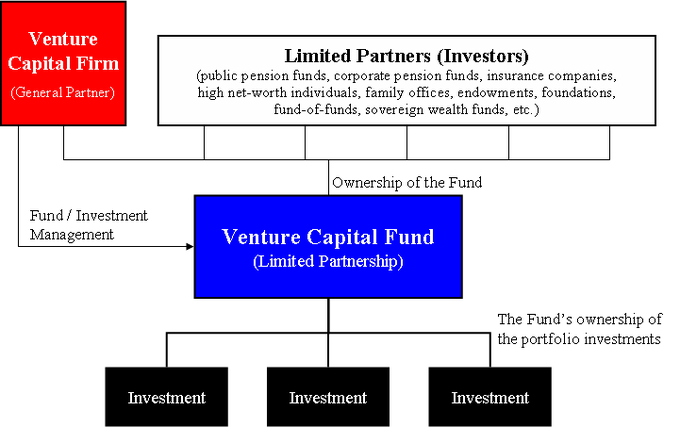 Structure of a Venture Capital Firm: The venture capital firm pools capital from investors and allocates it to venture efforts deemed worthy of investment. Seed money round: The entrepreneur must convince the venture capitalist to fund their business vision. The VC firm is looking for a number of qualities including a solid business plan, an effective management team, high growth potential, and high target minimum returns. The VC firm will investigate into the technical and economic feasibility of the venture’s idea. If it is not directly feasible, but the investor sees potential, the investor will choose to invest some seed money for further investigation. Start-up: VC firms provide capital to early stage firms that need funding for marketing and product development. Organization of the company is formed, with finalization of the management team and establishment of an individual from the VC firm on the company’s board. The prototype product/idea is developed and tested. Market research for the idea is conducted, and the VC firm also monitors product feasibility and capability of the management. If at this stage the VC firm is not satisfied with the progress from market research, the VC firm may stop their funding and the venture will have to search for other sources of funding. Second-Round: Early-stage companies that are selling product but not yet turning a profit receive working capital. Expansion/Mezzanine financing: As the name suggests, VC firms provide expansion money for a newly profitable company. Bridge financing/exit of venture capitalist: Finally, the company is expected to either “go public” or be bought by a third-party company. The VC firm then exits by selling off its shareholdings of the company. The investor’s risk of losing the investment decreases as the company advances from one round to the next of this process. Long-term debt is a means of financing that allows firms access to capital without diluting equity; capital & interest is paid off over time. Debt financing takes the form of loans that must be repaid by the borrower over a specified period of time, usually with interest. Generally, debt financing is most appropriate for firms who are in the start-up phase or have progressed to the maturity phase. For young companies, debt financing usually takes the form of bank loans, while mature companies may issue bonds. When investors buy a corporate bond or the bank loans to a small business, they must have faith that the company will have the means to repay them. Riskier investments will require compensation for the lender in the form of higher interest rates. Bonds may be an attractive alternative to getting bank loans or issuing stock because it can have less restrictive loan terms and better interest rates than loans, and it doesn’t dilute equity or ownership as stock does. It also has considerable corporate tax advantages. Costs of debt financing include: bankruptcy costs (in the event of inability to cover payments to lenders) and increased uncertainty about future financing needs. In the most basic terms, debt financing takes the form of short-term or long-term loans that must be repaid over a specified period of time, usually with interest. Money is borrowed, and usually the borrower ( debtor ) gives the lender ( creditor ) a promissory note that obligates the debtor to pay back a certain defined amount at a particular and defined time in the future. Bank loans as a means of financing: A promissory note dating to 1926 from the Imperial Bank of India, Rangoon, Burma for 20,000 Rupees, plus interest. With debt financing, the creditor’s return is fixed as the agreed upon interest rate for the debt, which varies depending on the perceived riskiness of the debtor. Debt financing usually takes the form of bank loans or bonds. Bonds are a debt security under which the issuer owes the holders a debt. Depending on the terms of the bond, the bond issuer is obliged to pay the bondholders interest and/or to repay the principal (also known as nominal, par or face amount). Most corporate bonds are fixed-rate bonds, meaning that the interest rate stays the same until maturity. Some use floating rates to determine the exact interest rate paid to bond holders. The interest rate paid on these varies depending on some index, such as LIBOR. Other corporate bonds, called zero-coupons, make no regular interest payments at all, but investors still receive returns because these bonds are originally sold at a discount, and then are redeemed at par value upon maturity. The interest that the firm will pay ultimately comes down to one factor: at what rate will investors believe the bonds are a good investment? Riskier investments will require compensation for the lender in the form of higher interest rates. Indicators for riskiness can include individual credit histories (for a bank loan) or bond rating by a credit rating company (for corporate bonds). The difference in yield reflects the higher probability of default and liquidity and risk premium. The actual effect of the firm’s capital structure on firm value is a contested topic in financial theory (see Miller Modigliani Theorem). From a tax perspective, debt financing may have some advantages over equity financing for both investors and the firm. Under a majority of taxation systems around the world, firms are subject to corporate tax and individuals to income tax, leading to double taxation of dividends, if the firm is financed through issuing stock. For example, a firm that earns 100 dollars in profits in the U.S. would have to pay around 30 dollars in taxes. If it then distributes these profits to its owners as dividends, then the owners in turn pay taxes on this income, say 20 on the 70 dollars of dividends. The 100 dollars of profits turned into 50 dollars of investor income. If, instead the firm finances with debt, then, assuming the firm owes 100 dollars of interest to investors, its profits are now 0. Investors now pay taxes on their interest income, say 30 dollars. This implies for 100 dollars of profits before taxes, investors got 70 dollars. The firm also benefits considerably, as interest payments can be deducted from the firm’s taxable income while dividends and share repurchases cannot be deducted. It is also postulated that debt makes management more disciplined, forcing them to work harder to ensure that they will make enough to cover their interest payments. These benefits are applicable to both bonds and bank loans. However, costs of debt can outweigh these benefits, depending on the firm. In the event of inability to repay debts, firms go into bankruptcy which is a costly process in itself. Furthermore, the more debt a firm takes on, the more uncertainty it will have about future financing needs: if a firm is already taking on a considerable amount of debt today, where will it get financing for its operations in the future? Firms may raise capital by receiving funds from investors in exchange for equity stakes in the form of common and preferred stock. Firms using equity financing gain financial capital from investors, in exchange for ownership stakes in the firm in the form of common and preferred stocks. The main advantage of equity financing is the lack of an obligation to pay back all investors in the event of poor company performance, while the main disadvantage is diminished control and business autonomy. In the event of liquidation and dividend payments, preferred stock has priority claims to assets. Common stockholders must wait until all preferred stockholders have been paid in full. In the event of bankruptcy, common stock investors receive any remaining funds after bondholders, creditors (including employees), and preferred stock holders are paid. Common stockholders often have voting rights, exercising some measure of control over company board elections and corporate policy, while preferred stockholders usually lack these rights. Preferred stock is divided into a number of sub-categories including: cumulative preferred stock, non-cumulative preferred stock, participating preferred stock, and convertible preferred stock. Equity financing occurs when ownership stakes in a particular firm are exchanged for financial capital from investors. These investors may be all types of people, from friends and family of the business, to wealthy, “angel” investors, to venture capitalists. The main advantage of equity financing is that the business is not obligated to repay anything, since the individual investors are assuming a certain amount of risk in return for the possibility of making money in the future. However, because equity financing involves trading funds for ownership in the company, these new investors do gain some decision-making power in the company, and the managers lose some autonomy. Typically, firms obtain their long-term sources of equity financing by issuing common and preferred stock. Holders of common stock (also be known as a “voting share” or an “ordinary share”) often have voting rights on corporate policy and have a say in electing the firm’s Board of Directors. They also receive dividend payments if the firm offers them. That being said, in the event of liquidation, preferred stock is considered more senior than common stock, in terms of rights awarded to particular investors. If one investor has preferred stock, while another holds common stock, that first individual has more rights to their share of assets, in the event of a liquidation. After bondholders, creditors (including employees), and preferred stock holders are paid their full share, common stock investors receive any funds that still remain. Thus, it is clear that common stock investors have the riskiest investment, often receiving nothing in the event of a bankruptcy. 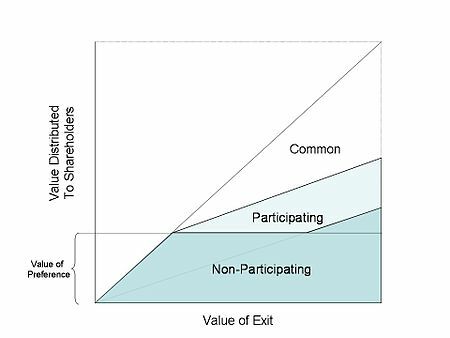 Participating Preferred vs. Non-Participating Preferred: This graph shows an example of a liquidation event, illustrating how assets will be divided up between common, participating preferred, and non-participating preferred stock holders. All preferred stockholders are paid first, before common stock holders. Participating preferred stockholders can “double dip”, and are entitled to both their money back, as well as the leftovers for common stock, proportionate to the amount of common stock for which their preferred stock can be converted into. Preferred stock is considered to be a form of equity security. It has properties of both an equity and a debt instrument, making it a “hybrid instrument”. Preferred stock generally has preference in receiving dividend payments and always has preference in asset claims during liquidation. That being said, holders of this type of stock usually do not have voting rights, while common stock holders do. Almost all preferred shares have a negotiated, fixed-dividend amount. The dividend is usually specified as a percentage of the par value, or as a fixed amount (for example, Pacific Gas & Electric 6% Series A Preferred). Sometimes, dividends on preferred shares may be negotiated as floating. This means that they may change according to a benchmark interest-rate index (such as LIBOR). In general, there are four different types of preferred stock: cumulative preferred stock, non-cumulative preferred stock, participating preferred stock, and convertible preferred stock. With cumulative preferred stock, If the dividend is not paid, it will accumulate for future payment. With non-cumulative preferred stock, dividends will not accumulate if they are unpaid. In other words, holders of this type of stock cannot make claims to forgone, past dividends. Convertible preferred stock are preferred issues which holders can exchange for a predetermined number of the company’s common-stock shares. This exchange may occur at any time the investor chooses, regardless of the market price of the common stock. It is a one-way deal, and an individual cannot convert the common stock back to preferred stock, if they have already exchanged their preferred stock with the company. The final type, participating preferred stock, are preferred issues that offer holders a set, specified dividend. These also offer investors the the opportunity to receive extra dividends if the company achieves predetermined financial goals. In the event of liquidation, holders of this last type of preferred stock are entitled to receive back the total amount they invested in the company, as well as the accumulated unpaid dividends, before any common stock holders are paid. There are capital costs associated with equity financing, including accounting and legal costs, as well as underwriting and filing fees. For new issues of stocks, there are flotation costs that must be taken into consideration before choosing equity as a method of long-term financing. These can be established with the following formulas. Cost of preferred stock = Next dividend to be paid/[Current market value(1-flotation costs)]Cost of newly issued common stock = Next dividend to be paid/Current market value(1-flotation cost) + projected growth rate.